If you are a light sleeper, or if you have difficulties sleeping for whatever reason, you might want to try using earplugs when you go to bed. A good pair of earplugs for sleeping can seriously improve the quality of your sleep, although it might take a bit of getting used to. If, however, you are willing to adapt to wearing earplugs during the night, you will find that you wake up well-rested and with a much-improved mood. This is because your brain is never fully asleep, thus often processing noise as you sleep, occasionally disturbing your sleep without you even knowing it. 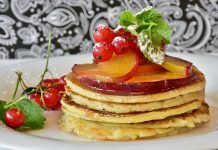 You will then wake up tired, distressed, and in a generally bad mood without knowing why exactly. To save you the trouble, you should consider getting some earplugs for sleeping. We should point out, however, that not all of these earplugs are built to the same standards, which is why you should take the time to figure out which ones best suit your needs. To give you a good idea of what’s out there, we put together a list of the ten best earplugs for sleeping the market has to offer. 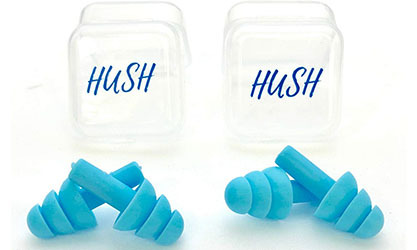 With the Hush Noise Cancelling Earplugs, you get to hush your night for a perfect sleep. It should be said right from the start that these are some of the best earplugs for sleeping on the market today. Featuring a thin, wireless design, they adhere to the subtle contours of your ear, providing ideal, long-wearing comfort and noise-reduction. These plugs further integrate a soothing construction, pacifying you even more into a deeper sleep. They also stand out for being extremely lightweight and easy to store. The Boules Quies by Caswell-Massey, some of the softest, most comfortable earplugs you can get today, are made of best-quality beeswax balls individually wrapped with fine cotton. The beeswax gently warms to your inner ear shape providing effective, maximum noise dampening. These plugs are effective for sleeping as they are for travels, swimming, and other ear-protecting moments. They also fit in easily regardless of the size of your ears, a flexibility that recommends them for people with oddly shaped earlobes. The Ohropax earplugs might be what you need for your nighttime sleep calm—keeping inevitable noises all at bay. Made of a fine quality wax compound that is wrapped using premium-grade cotton, these earplugs provide a perfect fit and stay comfortably inside your ear canals, creating an effective seal against noise, water, bugs, etc. Ohropax Wax ranks among the very best performing models out there, thanks mainly to their versatile design. We say this because even travelers, swimmers, and divers can get good use out of these chic earplugs if needed. As the name suggests, the Flents Quiet Time Soft Comfort earplugs are designed for optimizing noise reduction to let you have an uninterrupted, relaxing bedtime. Providing 33-decibel noise reduction rate, the Flents Quiet’s plugs have a smooth, tapered foam design for optimum comfort all the night. They are quite gentle on your inner ear, reusable, and also durable, features one should always look for in a pair of earplugs for sleeping. Fit these little, comfy beauties into your ears and go sleep without the interruption of any noise around you. The Harris Health & Home Ear Plugs remain clean and hygienic, thanks to the individual packaging they come in. Made of high-quality slow expanding, soft foam, they are simple to wear and very comfortable for a longer, much broader use. Furthermore, the plugs integrate great NRR, deflecting much of the noise that may risk your ears or trouble your sleep. Liberty DuraPlug earplugs are some of the best disposable earplugs the market has to offer. Made of premium-grade, soft foam materials, they feature an ultra-soft, tapered and slow-recovery foam design, ensuring ease of insertion into the ear(s) and removal too. We should point out that the foam used is the low-pressure, self-adjusting type; this ensures that you won’t suffer any discomfort, no matter how long you wear the plugs for. In more technical terms, they offer a 32-decibel NRR, a quality no other earplugs in this price range have. With these Moldex Pura-Fit earplugs, you get to experience a full night’s sleep with virtually no distractions. Thanks to a longer, convenient design, the plugs are easy to fit and to remove. Their premium-grade, PVC-free, and non-irritating construction involves an ultra soft foam with a very smooth surface for good measure. The foam is also tapered to provide an effortless insertion into any ear size and shape. It should also be said that the set comes with an earplug station dispenser. Designed to deliver a high 31 dB NRR, this represents another great earplugs option for calmer nights. It is a custom-molded model that offers appreciable noise canceling but also a comfortable custom wearing feel. Its design allows you to shape, mold, or remold to your individual convenience and comfort, simply using warm water at will. Available in a set, there are two thermo-plastic custom molds and various sizes and shapes of foam tips and triple flange tips for added versatility. Coming from Honeywell Laser Lite, this is a top-efficiency earplugs model, one made of best-quality and self-adjust foam that can expand to suit nearly all ear types. These earplugs boast a contoured T-shape to ensure smooth insertion into the ear and ideal fit. At the same time, their soil-repellent smooth skin guarantees a zero dirt buildup, which is something to look for in any quality earplugs. Interestingly enough, these plugs come in different colors to choose from. Mack’s Mac-6244 earplugs are incredibly popular and understandably so, thanks mainly to their ultra soft model integrating, ultra-low pressure, and high-quality foam construction that provides comfort above all else. Not only that but their high Noise Reduction Rate (NRR) at 32 dB makes them a highly effective solution for dampening noise throughout the night. Besides sleeping, you can also use them in workshops, at concerts, or pretty much anywhere else where you need to limit environmental noises. It is perhaps due to their versatility that they are seen as some of the best earplugs on the market at this point in time.